Being Authentic; Are you for real? •online influencers •social media junkies •creative entrepreneurs •seasoned business owners •new business owners •bloggers of many forms including food, family, fashion, lifestyle, designers, event photographers and artists. We got this. It’s still a blast and no day is the same. Our poor intern has no idea what to expect when she shows up and frankly neither do we! 2. We know who we are. it just naturally evolved and now its apparent whose better at what tasks. players (kinda) and we want to live a balanced life. 4. There’s no need to keep up with the Jones’. It’s so inspiring what all these people are doing and we watch in awe of the instagram feed of some of the people we follow. We’re cool. We are the Embellish Girls and our goal is to provide great service and continue our good reputation. 5. It’s good to play. business and make our schedules and we are always happier and more motivated after we have taken some time off. This photo was from the Summit online photo gallery taken by the fabulous Nickie Cutrona. This is the first of a series of posts about how we work with clients who are not in the Charleston Area. Just because because we are in the “843” doesn’t mean we cant work with you! Don’t worry, that’s all about to change! Great room before looking into the sun-room. Great room before showing front windows. Out client requested that they wanted this sun-room to have more of an “adult seating” area. Sun-room Before. She started getting rid of furniture to get ready for the transformation. Sun-room before looking back into great room. In the office (which is the first room when you enter the home) their request was for more office/desk work space for the whole family. Stay tuned to watch the process of distance design in action! The One Room Challenge is complete! This has been a fun experience and we’d like to first start off with thanking Linda from Calling it Home for letting us participate! We are always excited about the pictures so here they are..
We styled the table with some of the clients things and then some goodies of our own such as a Fiddle Leaf Fig to the space! And did you notice how well the table turned out?? We were able to find a fabulous mirror locally at GDC Home. Whew-hoo! Through this journey we had some bumps in the road (which we new would happen) ,but we would not change one thing about this experience. It has been an amazing transformation for our client’s home. 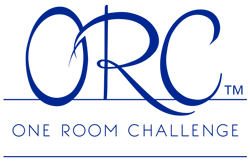 Thanks to everyone for keeping up with our amazing journey through the One Room Challenge!